Outgoing US President George Bush has said his biggest regret is the failure of intelligence over Iraqi weapons. 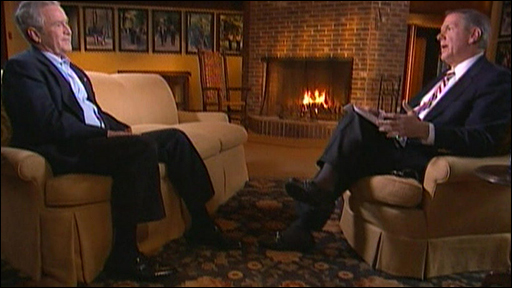 In a wide-ranging TV interview, he declined to say whether he would have decided to invade Iraq if he had known it had no weapons of mass destruction. Asked about what he regarded as his greatest achievement, Mr Bush said that his administration had fought a war against "ideological thugs". Mr Bush will hand over to President-elect Barack Obama on 20 January. The outgoing president told ABC television: "The biggest regret of all the presidency has to have been the intelligence failure in Iraq." He added: "I wish the intelligence had been different." Asked what his greatest accomplishment was, Mr Bush replied: "I keep recognising we're in a war against ideological thugs and keeping America safe." He also defended his actions over the recent economic crises. "When the history of this period is written, people will realise a lot of the decisions that were made on Wall Street took place over a decade or so," he told ABC. Mr Bush - whose approval ratings are at an historic low - said he was happy for history to be his judge. "I will leave the presidency with my head held high," he said. Will Bush Iraq plan affect US race?